Please complete each section as fully as possible and return in the pre-paid envelope provided. Constable Thumper has a problem: he's intellectually sub-normal. Unfortunately we can't do anything about that. But we can help him sort out his latest dilemma. One of these two East European gentlemen is an illegal immigrant, whereas the other is a successful businessman, a member of the local Conservative party and a personal friend of the mayor. Unfortunately they both look alike! "Constable Thumper should beat up Gentleman A. Then if it turns out that he's the businessman, he can always say that Gentleman B did it." Awww! Sergeant Bigot has gone and got himself lost. See if you can help the gormless prick find his way back to Scotland Yard. "Mmmmm, tricky. If I was Sergeant Bigot, I'd give it up as a bad job. It must be near the end of his shift anyway, so he may as well just turn around and go home." "Piece of piss! It's obviously number 7, Mother Theresa of Calcutta - a right old villain if ever I saw one. If I see her around my manor, I'll give her a damn good kicking." 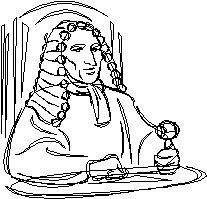 Using crayons or felt tips, colour in this picture of famous high court judge, Justice Terry Spandex. You can get an adult to help you if you like. "You can be as creative as you like but try not to go over the lines. Our specially selected panel of colouring experts will choose the four best entrants, who will then be offered positions with the Avon & Somerset Constabulary. And remember, bribery is not only allowed, it is actively encouraged as it demonstrates initiative and a familiarity with our way of working. Evenin' all..."